The Great Stitched Postcard Swap – An international swap – how fun that would be! Participants were to make an art post card. 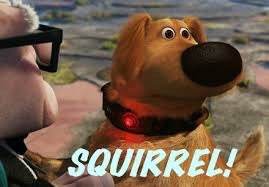 It could be paper, fabric or the medium of their choosing. No surprise I chose fabric. My base was a heavy weight fusible 5 x 7. 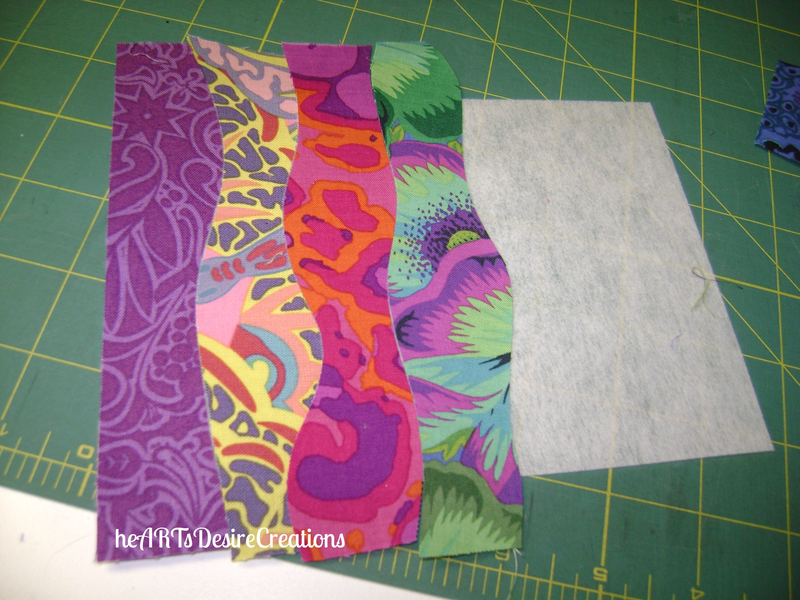 I began by pulling various scraps working from a Kaffe Fasset print and then adding to it – I chose 7 for my background. I layered the first two, cut a wavy line, then pulled them apart. The first piece was fused to the base. I then layered the next two fabrics, cut a wavy line, and placed the first of those two onto the base, fitting it to the first fused piece. 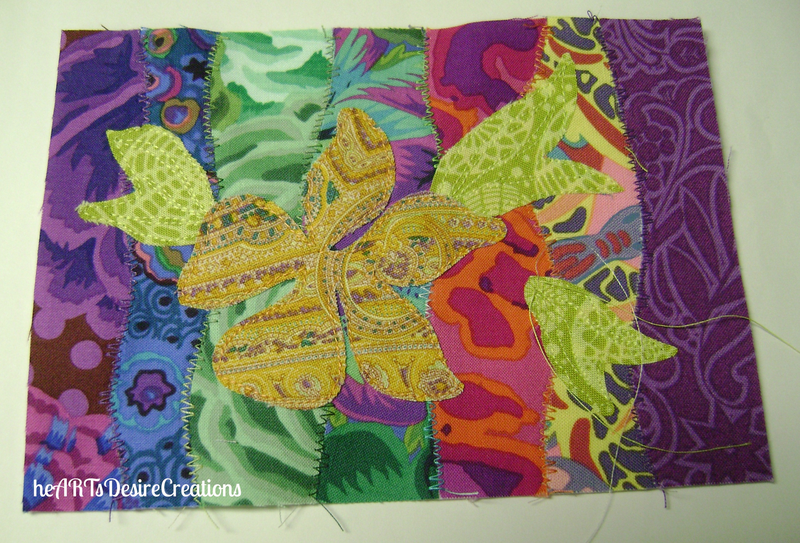 I did this with all 7 fabrics – it was a fun and colorful puzzle! I used an uneven zig zag down the center of each seam using various threads. I then cut leaves, a flower and the same flower in a small size. I fused the first layer of the flower, stitched around the edges and then layered the second flower on top of it. 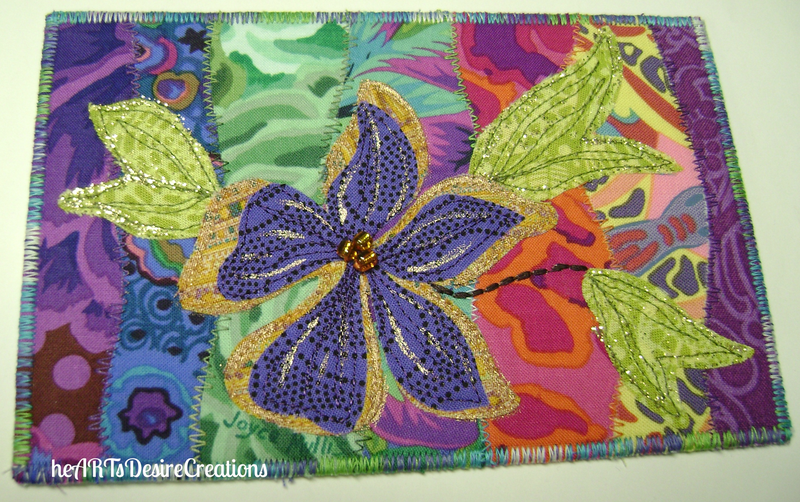 All this was done with a fusible backing. I placed the leaves and then fused those down also. I did some free motion stitching on the top flower and leaves. Embellishment was done with a few beads in the center of the flower and highlights done with some glitter paint on the leaves and Lumiere on the flower. I then fused a piece of off white to the back of the card, trimmed the card to a 4 x 6″ and zig zagged around the edges using a varietated thread. This card is now off to Hong Kong to my swap partner. I can’t wait to see what I receive in return! I’m especially greatful for this swap because it gave me an evening of creative play! Posted in Art, Fabric, Quilting, Swap and tagged art postcard, Color, Scraps, swap. Bookmark the permalink. This is my first swap; first sewn postcard actually. Thanks for describing what you did – I never would’ve thought of layering a background – very inspiring! Love how vibrant your card is! Thank you Karen. It was a lot of fun!